A New year means we are all putting our best foot forward. Not just with health but in our life, schedules and even home. Which is why today I am talking all about Easy tips & DIY ideas to keep the whole family organized! 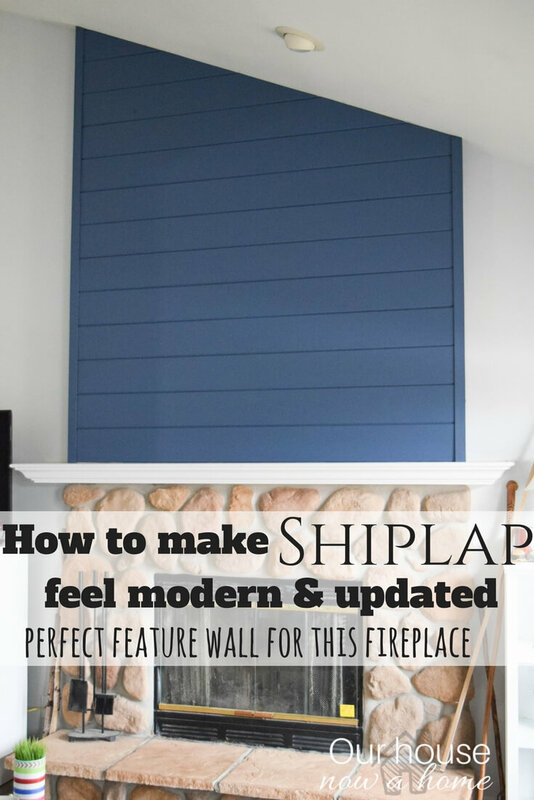 I share a lot about my home, and most of it is the pretty and Pinterest ready pictures. I always put my best decor and style forward in terms of sharing my home online. So on an average day my home is a little less “done” than what is generally seen here. However, I keep things pretty picked up and organized around for the most part. This home is our oasis, the place that I walk in and can finally take a big deep breath, releasing all of the craziness from the day. Which means my house needs to be more or less picked up. Allowing that relaxation to happen. But, I mean…. we are an active household, 3 kids, two dogs, 2 adults with crazy schedules. It takes a lot of planning to keep this well oiled machine, machine-ing. I stay on top of a lot of this by being organized at home. So I am sharing those simple, easy tips & DIY ideas to keep the whole family organized. It does take some pre-planning on my part to update the command center calendar each month. That time at the beginning of the month is time well spent! I also use this command center to hold my kids extra curricular activity gear, uniforms, cleats and other sport “stuff.” So there is no frantic search for their gear when we have 5 minutes before game time. This little nook in our home in the hallway and laundry room is packed with a ton of items. I took what is typically wasted space at the end of the hallway and made the family command center. Our laundry room is also the entry from our garage, so we carved out a little corner in the laundry room for a mudroom for my kids. Here they hang their coats, back packs, and any snow gear. They also put their shoes in these wooden boxes. Most importantly, I hung simple wall baskets for each of the kids to put their library books, homework, or any other papers I need to go through. 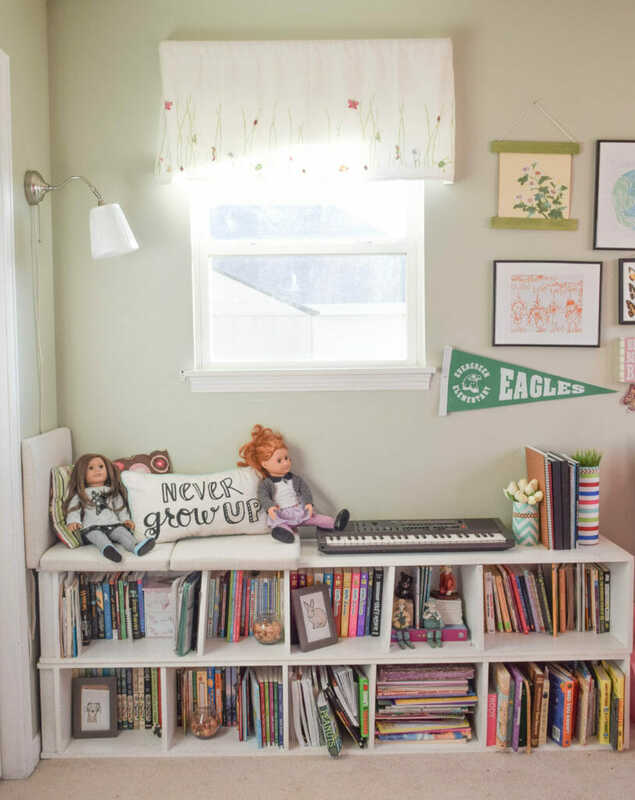 My biggest tip ever to staying organized with kids is to have everything have a place to go. Otherwise when you tell the kids to clean up or put their school stuff away they walk around like zombies, with one random piece of paper or toy, mumbling something and walking in circles. With everything set up for a specific purpose my kids know where their backpacks go when they come home from school. I go through their papers, throwing in the recycling what needs to, and then putting the rest in their baskets until it is homework time. The process takes all of 5 minutes and the rush of coming home in the afternoon is simplified. We call the mudroom area our “organization station” and it is legit the hub of our kids organization. My husband wonders how our home has become overrun by the kids and their stuff. I just shrug and tell him to hold on tight, it will be a wild ride for the foreseeable future with kids, their gear, schedules and stuff. One day we will get to hang our coats in the mudroom but for now this is the kids zone. For better or worse my kids see me as the “fun maker” in our house. I mean, on Saturday night I vacuumed our house and folded laundry. I am not exactly liven’ it up, but they still look to me for fun. One way I have really encouraged fun and creativity for my kids is with arts and crafts. When my kids were little I had a bin of typical art supplies, but my poor kids were never allowed to play with them. It was too much work to drag them out for them to just make a mess with the crafts and run away a short time later. To get over this struggle I commandeered a hallway closet and went crazy organizing it into an art supply closet. I went label crazy, which made my organizing obsessed self do a happy dance. 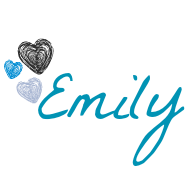 I would label or monogram everything if it would not look like a really weird OCD house. The issue was that when I made this art supply closet I had two littles that could not read yet. So I used bins that were color coordinated, green with paper and stickers. Green means go, have at it! Yellow means slow down and ask, this bin holds puzzles, glue, scissors, and markers. The top bin is red, do not pass go, ask a parental adviser for permission. This is full or paints and glitter, we need to keep that stuff on lock down. With the color coordinated and organized art supply closet it helped my kids know what the limits were and was also really easy for them to grab what they need. Clean up for their art supplies has been pretty painless since this system was created. Another great way to stay on top of the clutter/mess that kids making memories creates is to give them a place to be free. Let the mess out a little. 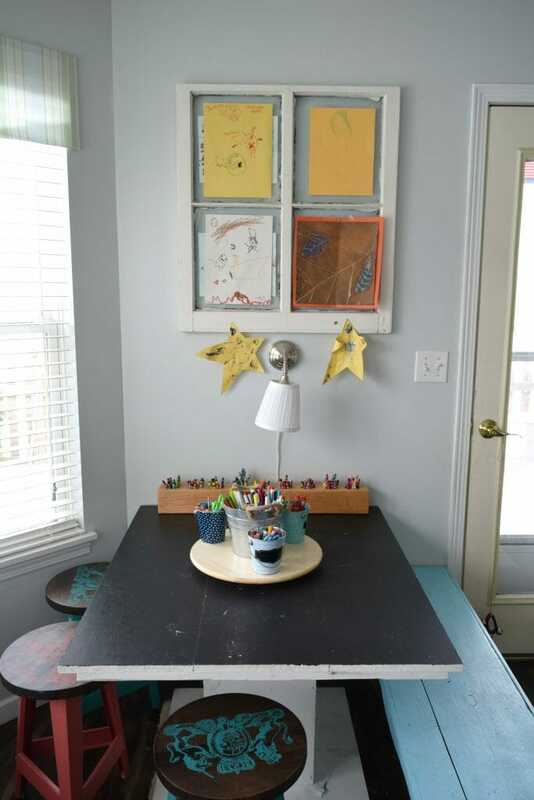 For years we have had a kids art table that was their designated mess place, this space has now matured into their homework area as well. There will forever be little bits of paper, some random glitter explosion and stickers stuck to this art table. But they go crazy making art, personal cards or gifts. They even steal our recycling items to turn into new treasures. For the art table the biggest way to maintain some kind of organization is to set up a good amount of storage for the art stuff on the table. Making a 4×4 wood crayon organizer as well as smaller containers for other items. This way there is none of that zombie action when it is time to pick up at the end of the day, they know where it all goes. One way I want to stress with my Easy tips & DIY ideas to keep the whole family organized, is to focus on the DIY portion of my tips. 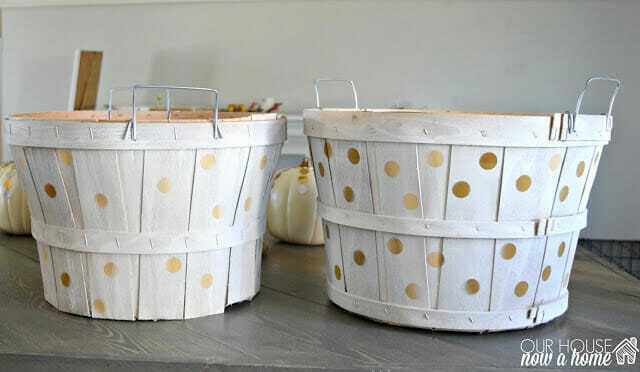 I know that many people want to get organized, but those cute bins at stores can get pricey! Having a lot of storage options, places to hide kids items… can add up to spending a good chunk of change. I have gotten really creative with my storage solutions, like the two baskets in the above picture. They were left over from when we went apple picking in the fall. I spray painted them, that is it! Perfect craft organization! Or sift through the recycling to find a few boxes. I used one large box to hold some puzzles and a few other smaller toys that are actually in our living room. I upcycled the box into a decorative storage bin. It looks adorable and was crazy cheap to make! I made two other storage bins from boxes planned to be thrown out. These two are also kept in the living room and used for my kids flash cards, ruler, or other homework specific items. It allows there to be an ease in doing homework or reviewing things without looking like a legit school classroom. All of this is hidden in my living room, out of sight but easily accessible. The bathroom drawers are a whole other kind of mess. I organized all of our bathroom drawers with some items I purchased at the dollar store. There is something about wide open drawer space that means kids just throw anything and everything in there. Add little containers or other storage items and they at least shove stuff in those. It may not fix the problem, but can be a start to keeping things easy to find. With kids you will never have enough space! Say it with me now, “I will never have enough space, with kids.” I am not talking personal space, I have no tips for that because I am currently writing this blog post with my bedroom door locked (Dale is home and in the living room). I still have two dogs at my feet and at least one child talking, whining or passing notes under the door. If you have any tips for personal space this Mama is all ears. I mean space for a home, storage, toy storage, clothes, stuffed animals (pretty sure ours are procreating on their own now). I made this DIY under bed storage using wood pallets. It sits under my daughters bed and holds a ton of toys that would otherwise be shoved under her bed, never to be seen again. This allows some control of the mess. 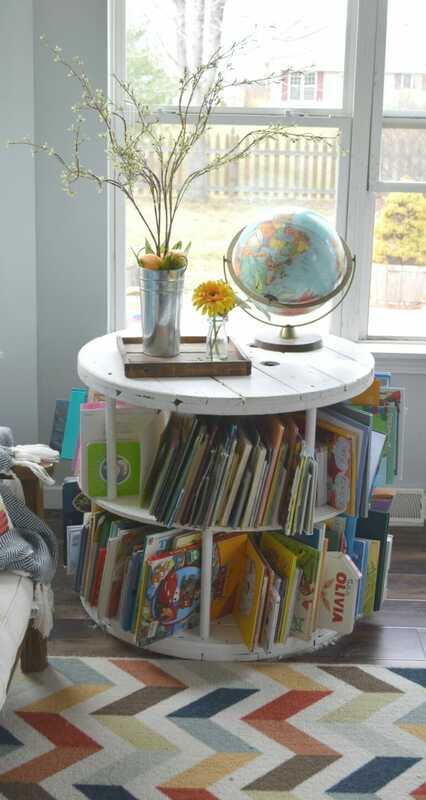 This might seem like a no-brainer but making good options for books is another Easy tip & DIY idea to keep the whole family organized! 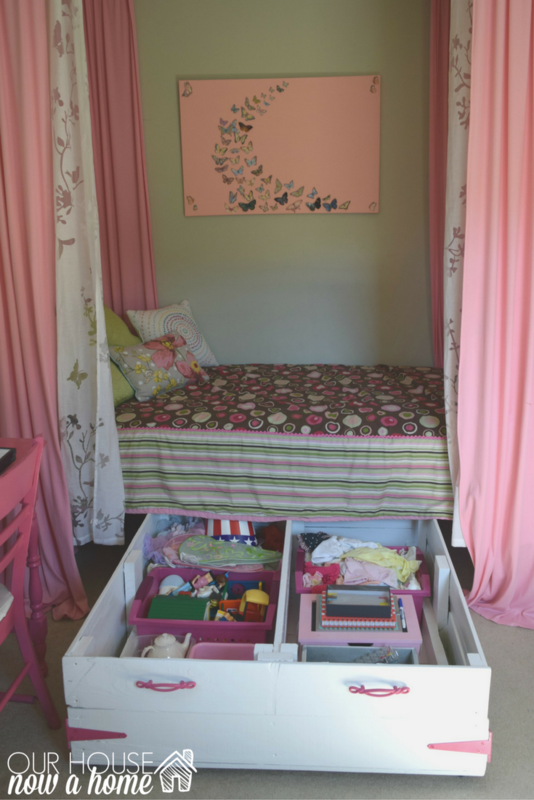 I made this little reading nook and window seat for Nora’s bedroom. I used two taller and skinny bookshelves and laid them on their sides. This is the perfect way for my bookworm to house all of her favorite stories. A simple and boring bookshelf is not the only option to display and store books. 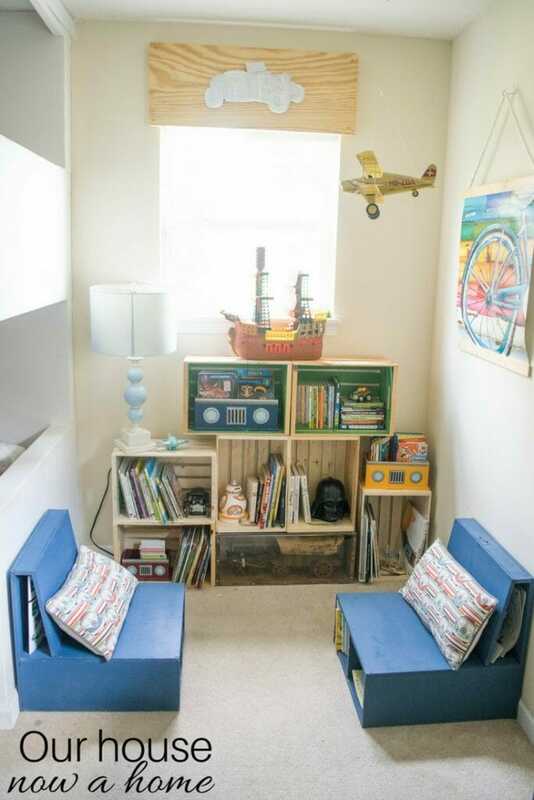 In Caleb and Gavin’s bedroom I used wooden crates for their reading nook. When we had our first baby we had Nora’s little baby books on a tiny shelf in her bedroom. Once we had three kids we had their books in the living room, stored in a cute basket. It was not enough space and most of the time it was a complete mess. My favorite furniture makeover ever was this old spool that I turned into my kids bookshelf. It is now in my bedroom, which I will be sharing the mini makeover soon! My kids outgrew this DIY old spool bookshelf, but it was so sweet while it lasted. That is another really good tip to keep in mind, a system that works great will one day become out of date for your family. Your household, kids ages and needs are always evolving, so your organizing and controlling of the mess needs to evolve as well. A small basket for books in the living room evolved into a full bookshelf in their play room. Now my kids have outgrown even that and I need two separate bookshelves in their bedrooms to fill with their books. I am sure this system will have an expiration date and I will need to change it up again eventually. Closets are a big time organization area to focus on. I wish I had it together enough to share our closets with you, but there is currently a “clean pile” of laundry as well as a “dirty pile” of laundry in our closet. Please tell me I am not the only one that does this?!! The kids closet’s I am going through to get rid of too small clothes. One thing that is on point in my closet is my shoes though! I made this plywood shoe organizer with low cost building materials. The great thing about this is that it is pretty enough to double as a make up vanity or table in a room. 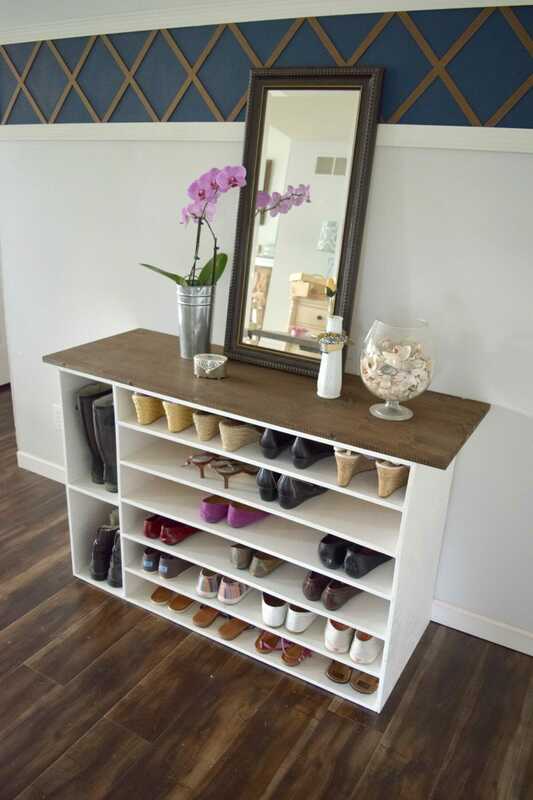 This saves space and keeps the shoes easily viewable to choose from. I need options people! 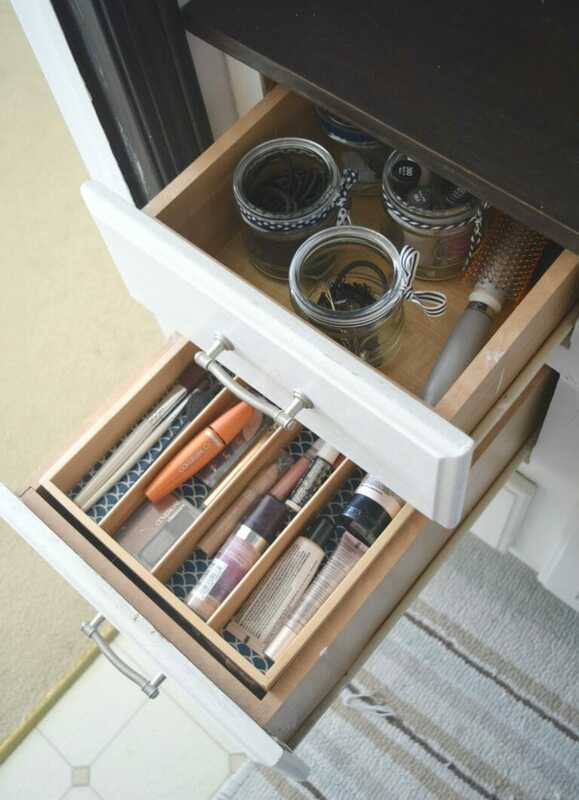 Function and style, one of my favorite Easy tips & DIY ideas to keep the whole family organized. That is it! 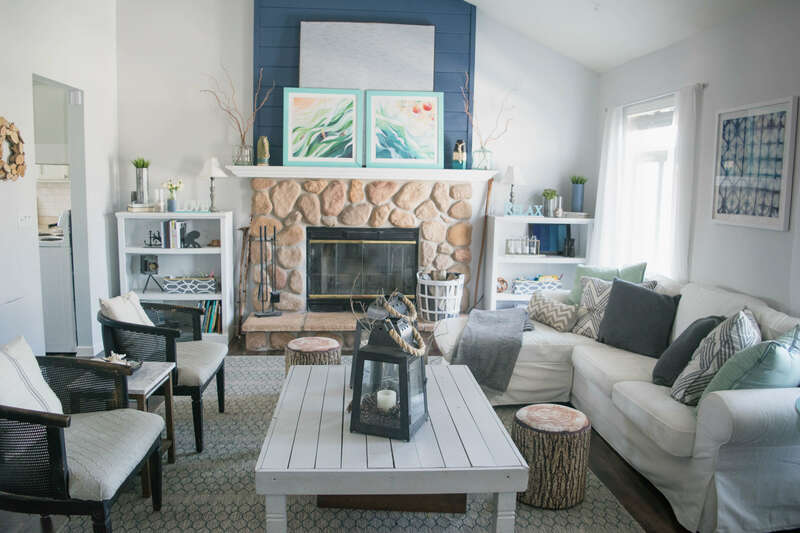 I am sure there is a ton of other little ways I have organized my home, but these are the Easy tips & DIY ideas to keep the whole family organized that I have used in my home the most. 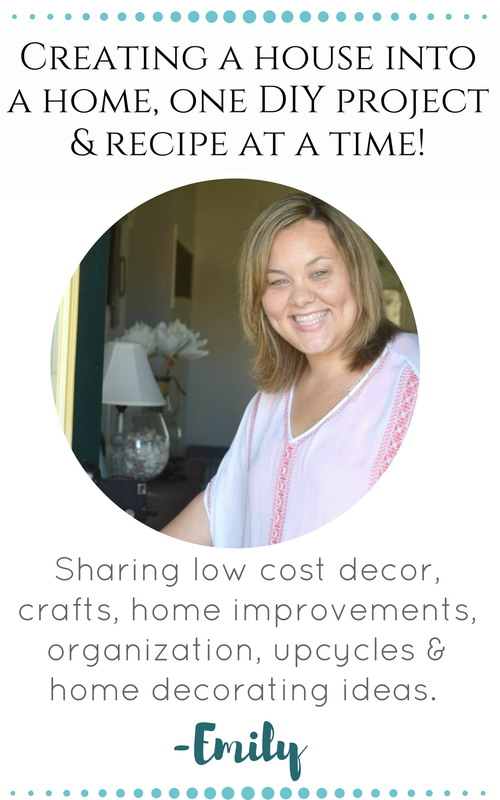 I also really wanted to focus on sharing creative ways to organize, keeping in mind low cost options and ways to implement the storage and organization into my home decor. I need function in my home all over, nothing is just there to be pretty. Well…. I have a lot of just pretty, but when I can combine function, organization, storage and making my life easier that is a big time win! Our home is the place we relax, rest, quiet the noise from the outside world. 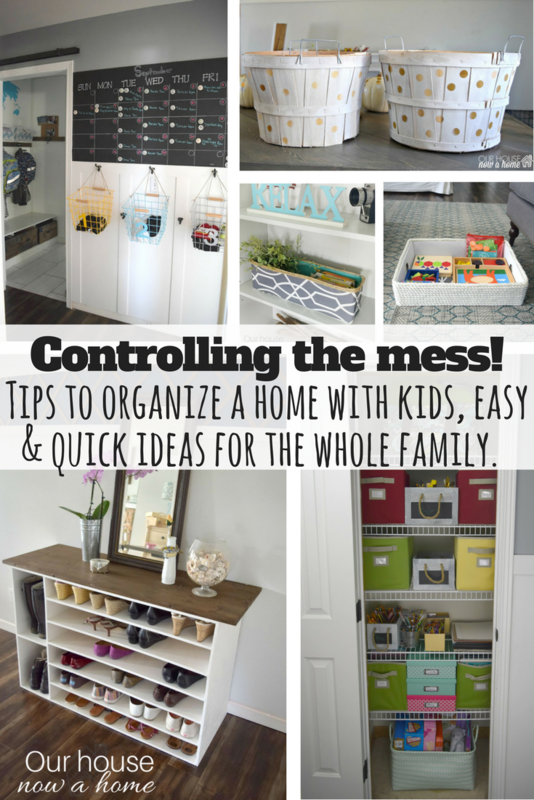 This is also the hub of our chaos, so staying on top of it all, everything having a place and creating a system that is easy for kids to follow is the way I stay on top of the mess in my home. What are some tips you use in your home to stay organized? 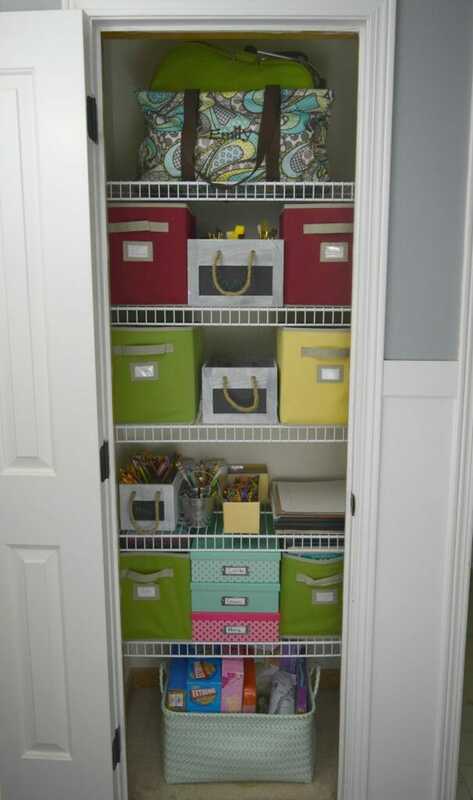 Love all your organizational ideas plus they are really pretty from a decorating point. 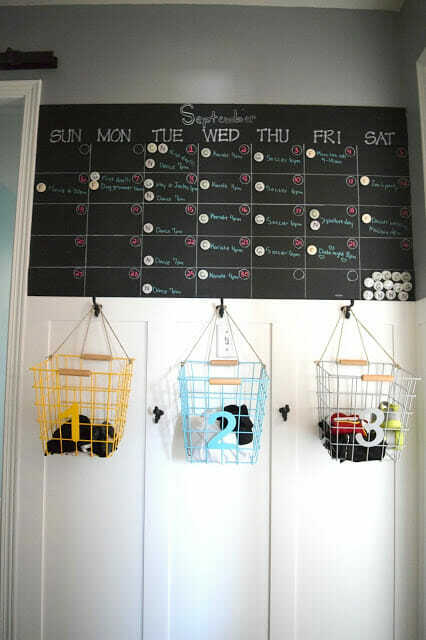 Will be sharing your chalkboard ideas with the baskets with my daughter. She has the perfect wall for this idea. I just love all your ideas. I am trying to get more organized, that’s for sure. 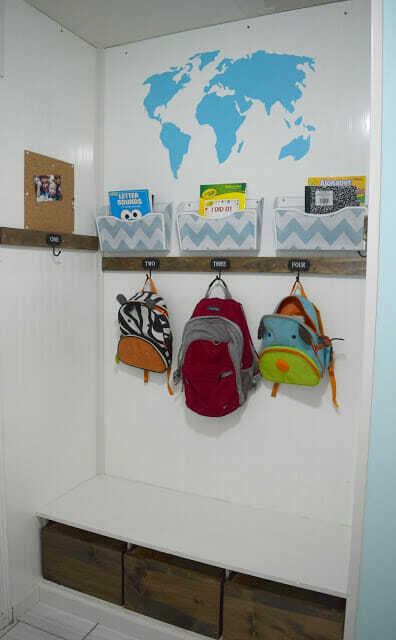 That backpack area is so cool! Ugh! My bathroom drawers are a mess, too! I need to take some time to organize them! But I have to say that the junk drawer in my kitchen is the WORST! I’m in the process of reorganizing my master bedroom walk-in closet. You’ve given me tons of ideas and I love the shoe organizer. I’m trying to get more organized and get rid of things we don’t use. Our shoes in the entryway seem to be the biggest mess for us so I’m glad you found solutions to this. Gotta try some of these DIY tips myself! I could definitely stand from some more organization at home. I would have loved a window seat on a bookcase to read on when I was younger. LOVE, LOVE, LOVE, LOVE, LOVE EVERYTHING about this post! I see so much good stuff that I could implement in our house this year to make it feel like I actually have a grip on this! 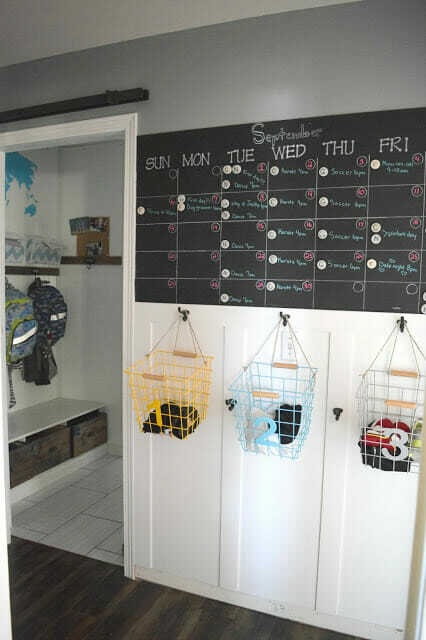 With four children and one dog – plus a husband, we all definitely need to get organized! Great ideas. I love a peak into your real home! It is pretty and organized but it looks like your family gets to enjoy it too! This is like my dream home! I have never been in even half that organized. Though, I am working on it. These are smart tips for organizing every part of the house. One area I need to work on is the kid’s art supplies. I totally need to overhaul their stash!! You are so organized. I love that old spool bookshelf. I want to make one of my granddaughter. 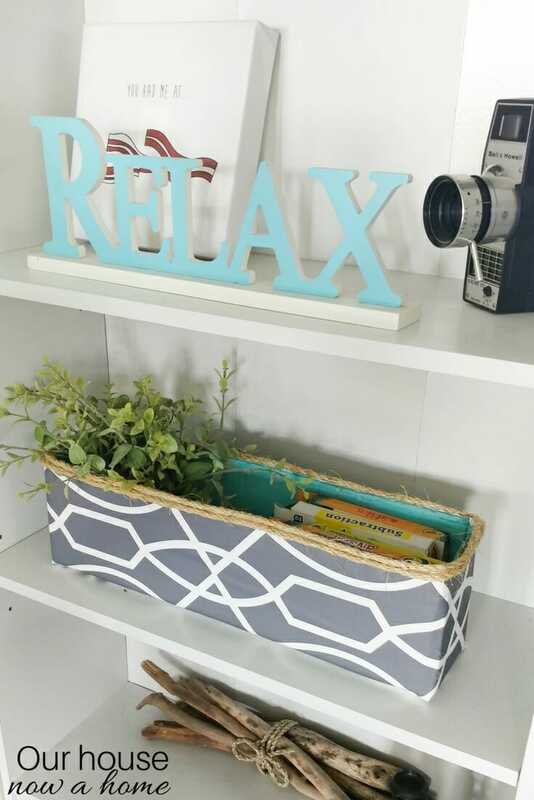 Baskets are my go to organization hack. I have a basket in every room and in a few rooms (den, living room, kids’ rooms, etc.) for quick pick ups. 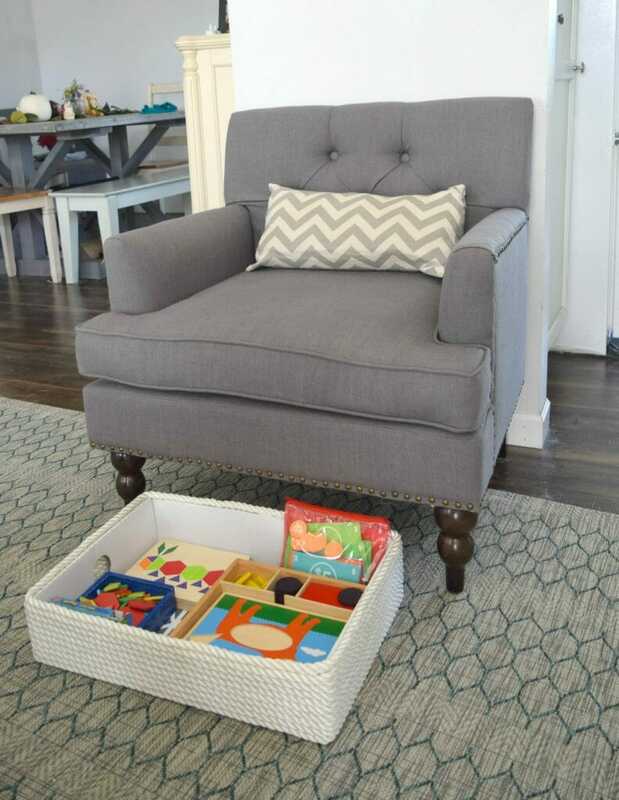 I also use storage ottomans to keep kids’ toys organized and out of site. Yes, everyone has their own storage ottoman in the den. To control you have to contain. And keep controlling. When my magazine basket gets full, no more. 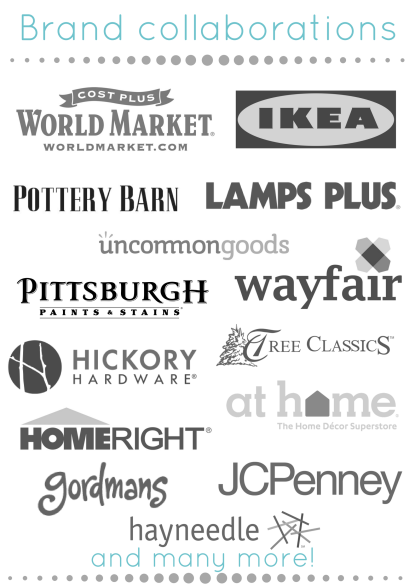 Some are donated. This whole post makes my OCD self HAPPY!! I love everything from the baskets, to the cubbies, to that awesome chalk board command center. This is quite an exhaustive and comprehensive post. 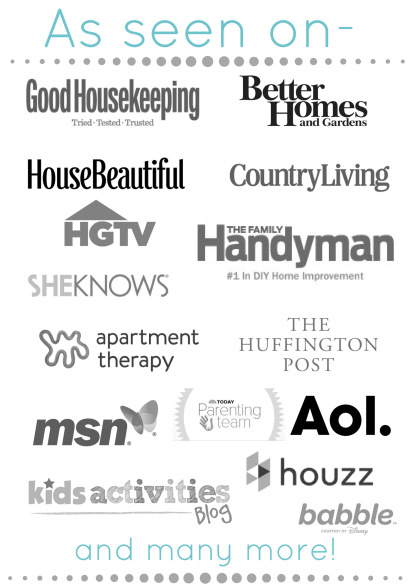 Great ideas to get the house organized and spick and span. I love the way the closets are makeover, love the way they have been integrated with the decor. 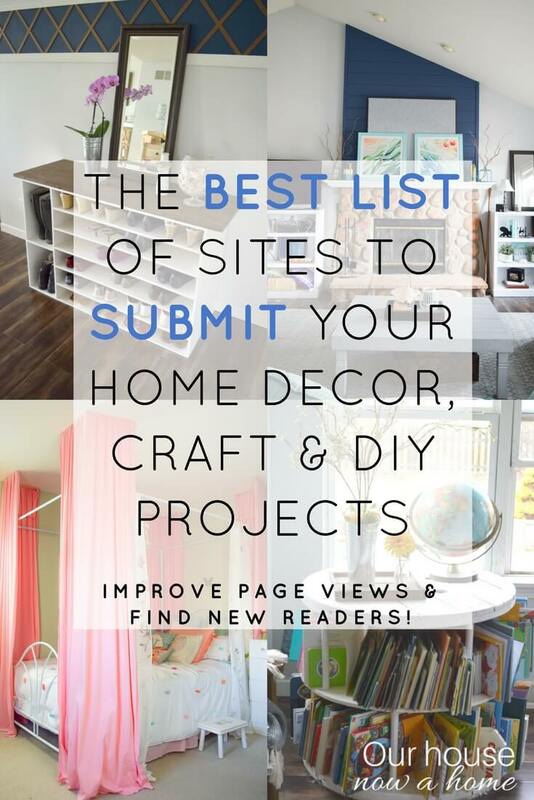 Oh my gosh what great ideas especially the shoe shelf and family command center! I need that shoe organizer in my life. Seriously shoes always end up all over the place in our house. Drives me crazy! It’s so important to keep organized when you have kids so you don’t spend your whole life looking for things! I love your ideas! 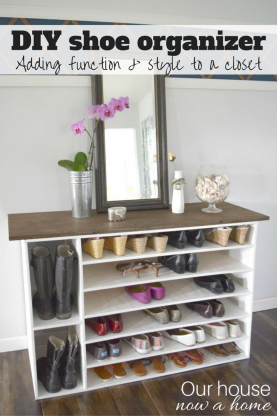 I am in love with your shoe organizer! We recently added a schedule that actually fits our family and we’ve been able to tackle the things on our list throughout the day. It definitely helps me pencil in some down time, too! Your house is gorgeous! I love your ideas for the backpacks and the clothes. I would do a chalkboard, but I know I would probably smear the writing and it would drive me nuts. Haha. I live alone (with a dog) but I am soooo OCD about organization!! I love all of your tips an tricks!! I love the idea of this. It makes everything organised! I love the hanging baskets and the designs. Now I have an inspiration for my home make-over.